Before 2011, efforts to remember and immortalize influential musicians from Colorado in a single music history museum had all failed. Then, in collaboration with former Denver Post journalist Gary “G” Brown, Chuck Morris took on the task of bringing the Colorado Music Hall of Fame to life. Morris’s career as a concert promoter and artist manager had started in 1969; over the years, he’d watched countless musicians from all over the state rise to fame. Morris and Brown envisioned creating an organization that would recognize more than one style or aspect of music. They created the Hall as a nonprofit with the mission of celebrating musicians working in all genres, as well as individuals and organizations that have impacted the scene. For these music enthusiasts, the only limitations were the Colorado state lines. With a board of dedicated industry and community leaders and a list of future inductees, Morris reached out to Comfort Dental, a Colorado-based company serving communities throughout the state. With its financial support, the Colorado Music Hall of Fame presented by Comfort Dental began the work of preserving and displaying the stories and artifacts of this state’s musical legacy. The Hall presented induction events that celebrated the artists and inductees and educated fans about Colorado’s rich musical heritage. Early Hall exhibits were housed in the 1stBank Center in Broomfield and then, thanks to Denver Mayor Michael Hancock and Governor John Hickenlooper, the Hall moved to its permanent home at the Trading Post at Red Rocks Amphitheatre, a Denver Mountain Park and one of the world’s best music venues. In 2011, its first year, the Colorado Music Hall of Fame presented by Comfort Dental inducted just one musician, Grammy Award-winner John Denver. The other inductee was the iconic Red Rocks Amphitheatre. Since then, the Hall has inducted more than 25 individuals, organizations and musicians, including Judy Collins; Firefall; Colorado’s successful surf-rock band, The Astronauts; Flash Cadillac, which appeared in the George Lucas/Francis Ford Coppola movie American Graffiti; the Nitty Gritty Dirt Band; Poco; Glen Miller; five-time Grammy-winning jazz vocalist Dianne Reeves; Charles Burrell, the classical bassist known as the “Jackie Robinson of classical music” for his work as the first African-American musician to be hired by a national symphony in 1949; and many more. In 2018 the Hall added inductees 97.3 KBCO, the legendary Boulder radio station that is celebrating over forty years on the air and helped create “album-oriented” Triple A radio, and Chuck Morris himself, who is responsible for the success of such artists as Lyle Lovett, Big Head Todd & The Monsters and who, along with Bill Graham’s company, opened the Fillmore Ballroom in Denver. During that celebration, Governor John Hickenlooper received the Barry Fey Visionary Award for his unwavering support for Colorado-based music and musicians. Exhibits in the Trading Post tell stories about much of the state’s music history in such displays as Jazz Masters, Live and on the Air, 20th Century Pioneers and Rockin’ the 60s. Others are devoted to individual inductees, supported by the artists themselves or their families. For example, John Denver’s wife made generous donations of clothing, instruments and other items from Denver’s personal belongings. The Judy Collins exhibit includes a beautiful dress from the singer and the original lyrics to some of her songs. 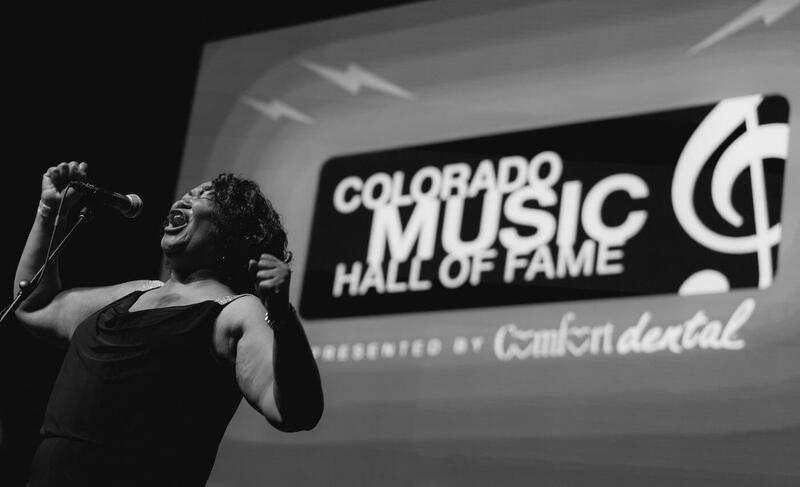 With a mission to educate, empower and inspire future musicians in this great state, the Colorado Music Hall of Fame presented by Comfort Dental offers an important educational experience. Schools and other organizations can tour the self-explanatory exhibits for free from 9 a.m. to 4 p.m. daily; on concert dates during the Red Rocks summer season, the Hall, which is located in the Trading Post just to the east of the main stage, often stays open until 7 p.m. The exhibits, films, and artifacts make learning about Colorado’s musical influences simple and engaging for everyone. Simply drop by the Hall or contact us to schedule a guided visit. Next PostNext Who Is Joe Walsh?